There’s a new threat in town – Jackpotting. 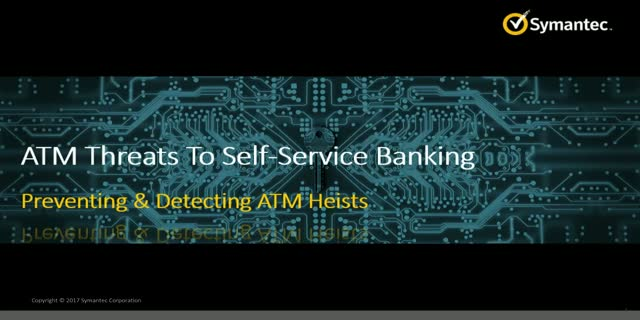 It utilises malware directly infected onto ATMs, requiring no card skimmers that can be easily detected, no time needed to steal credentials, and grants access to every single dollar held in the machine. ATM machines may not follow the strict patch management regimes that corporate machines do, leaving their operating system potentially much more vulnerable to malware attacks. Beyond the monetary loss, being Jackpotted can also negatively impact the brand, and expose the bank to regulatory action from lack of due diligence in risk management. Hear how Symantec Cyber Security Services can help deliver a solution for these types of attacks. Through the combination of Data Center Security (DCS) and Managed Security Services (MSS) monitoring, you will receive prompt validated detection of both pre and post compromise attempts in near real-time, allowing faster responses and remediation.